Gov. Doug Ducey urged lawmakers Tuesday morning in a press conference with leaders from both parties to pass a Drought Contingency Plan before a fast approaching deadline at the end of this month. The plan is part of a seven-state agreement, including Mexico, that would see all of them initiating certain restrictions and changes to keep the Colorado River from reaching an all-time low. A federal deadline of Jan. 31, 2019, was imposed on the deal, so all seven states must pass legislation approving of the plan and outlining the finer details before that day. However, no legislation has yet been written. Ducey said he was “anxious” to see lawmakers introduce bills, a sentiment echoed by others who spoke. The press conference, held on the ninth floor of the Capitol’s executive tower, included former Gov. Bruce Babbitt, former Sen. Jon Kyl and leaders from both the Arizona House and Senate from both sides of the aisle. They have 16 days to win approval for some form of legislation or else the federal government will intervene and the plans ratified by other states could become null and void. Arizona and California are the only states that have not approved a plan. Babbitt praised Ducey for bringing the group together, calling it an “awesome moment,” and adding that the state “cannot fail” in passing a plan. Ducey said that part of the legislation he is hoping to see will be a “culture of conservation” around the use of water in the state. The governor’s 2020 budget includes a $30 million in additional funding for conservation efforts for Lake Mead which was only 39 percent full as of Jan. 14 and 1,083 feet above sea level. Once the lake dips below 1,075 feet above sea level, the federal government will intervene and declare an official shortage. Ducey also wants to allocate an additional $5 million for infrastructure for agriculture projects. In a separate press conference led by Rep. David Cook, R-Globe, legislators and farmers gathered to voice their concerns over the plan. Cook stated that the best case scenario for farmers in Pinal County will be that they let between 30 and 40 percent of their fields go fallow. That’s why Cook and other legislators urged that the Legislature include $10 million, not the $5 million Ducey is seeking, for agricultural infrastructure such as wells and pipelines. In addition, Pinal farmers are requesting that a backstop on federal funds promised to those regions for agriculture infrastructure development also be a part of any legislation. The federal government has promised up to $25 million which, if backstopped by the state, would mean that state funds would pay for it to be refunded by the federal government at a later date. However, Cook and others stated they would not oppose the DCP legislation, even if those measures were not in place, because the DCP is needed. Their main goal is to ensure certain promises that were made during DCP negotiations are kept in regards to the amount of water agriculture will be allotted in the region. “This just can’t be figures written on a piece of paper,” Paul Orme, an attorney who has represented Pinal communities in water negotiations, said. Farmers also in attendance spoke up about their concerns. “We don’t want to wipe out a county, communities and a way of life,” Tiffany Shedd, a farmer from Eloy, said. A recent study by the University of Arizona found that 45 percent of Arizona’s cattle sales, 42 percent of Arizona’s cotton sales and 39 percent of Arizona’s milk sales come from Pinal County. Agriculture also accounted for $1.1 billion in sales in 2016 and 5,200 full- and part-time jobs, according to the study. 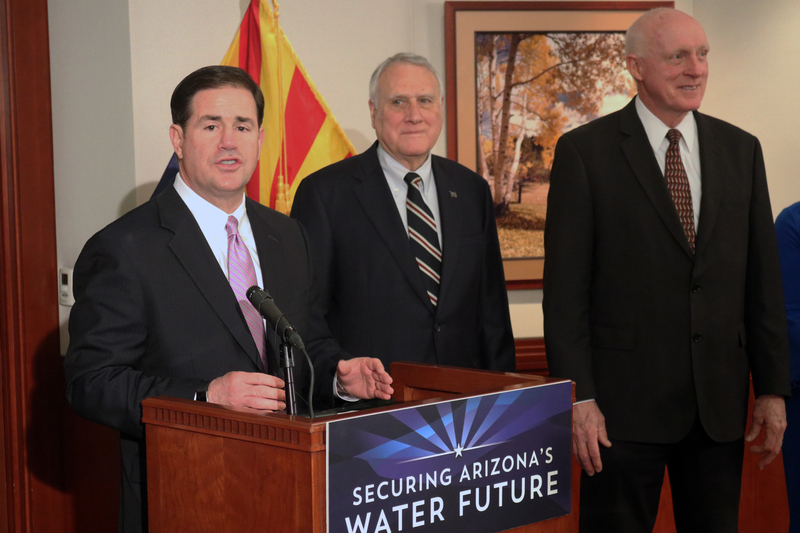 Water was a large part of Ducey’s State of the State address Monday. “This issue is important and it’s urgent. Our economy. Our environment. Our future. Let’s prove we can work together in a bipartisan fashion and get this done,” the governor said Monday. While certainly no one wants to see farmers hurt but hurting farmers will have a much smaller impact on the State’s future than a water crisis will. Ground water pumping should be a last resort, the depletion of the acquirer, subsidence, earth fissures are all the inevitable result. At the same time, unbridled development of more subdivisions out in hinterlands should stop as well. We also need to listen to water experts, there are a number of them at ASU.